Thao Ngyuen is a Virginian-born, San Francisco based musician who, aged twelve used to play guitar at the laundrette her mum worked at. Several years later, she has travelled the world with her band The Get Down Stay Down and has acted as a mentor for young women at a music camp. She kindly agreed to answer some of questions, from across the seas via email. KV: Hello Thao – as email interviews can feel a bit like a one sided conversation, I’d like to start by asking you to set the scene: where are you right now? and what are the best / worst things about being there? 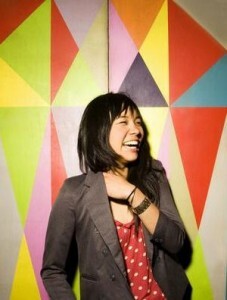 Thao: I am in my house in San Francisco, in the auxillary music room. Best: rent control. Worst: All houses in San Francisco are cold and drafty because insulation is terrible and we as a city don’t like to acknowledge that it is cold and wet a lot because we are in California and there are appearances to keep up. KV: I gather you recently played South by South West, was it your first trip there? What was it like to play? Thao: Actually this year we did not go because we were scheduled to be in the UK(!) but that trip was postponed. We went last year, it was a great hot mess. KV: I know you’re an active supporter of women’s issues, were you influenced by any particular individual or movement growing up, like riot grrrl? Thao: I was less influenced by music movements and more influenced by personal experience. KV: When I saw you in London with Dawn Landes a couple of years ago, you were solo, how did The Get down stay Down get together? Thao: We were together at that point I believe – I just happened to be doing thattour solo. We all met in College, I mean University. KV: Do you still sometimes play solo or is it always with the band? Thao:I still enjoy playing solo– i think it is very important to meet and maintain comfort with the challenge playing by yourself. Playing withthe band is great fun -they are two very different kinds of energy. KV:Last year you wrote a climate change blog for Oxfam and were involved with Rock Camp for Girls, were approached for both or were these areas you actively sought out to get involved in? Thao: I actively get involved with girls’ and women’s empowerment and literacy and writing programs for kids. It is a privilege and an honor for me to work with these different organizations. I also have a close relationship with OxfamAmerica and they asked meto write about climate change– which i am of course interested in– but am more focused on climate change as a women’s issue– how it affects women as primary food growers and heads of households around the world. KV: Given the album’s title (Know Better, Learn Faster), what have you learned through the course of making your album? KV: There are lots of guest-turns on your new record, but if you could play with any musician (and they can be living or dead from any era), who would it be? KV: One review quote I read was “You owe Thao’s ex a thank you”, do you think about how lyrics will be received and interpreted when writing them? and do you prefer to write from personal experience or in abstracts? Thao: I did consider how they might be received, but I write vaguely and obtusely enough that I felt I would not be sued and no one would bring to bear. I prefer to write from personal experience but the aim is to do it sopeople can interpret and connect with it however they deem fit. Thao: Maybe we will see you in the summer time? I am unsure but hopeful. Now I travel with my guitar handcuffed to my wrist so I am not worried. KV: I hope so too, thanks Thao! Thao’s album, Know Better, Learn faster is out now.